PORT OF VIRGINIA IS SEEING GROWTH IN TRADE LANES: CEO John Reinhart reports good peak-season volume and anticipates solid performance for the remainder of the year. Port of Virginia tracking for strong finish in 2017. The first rail-mounted gantry cranes are set for delivery to Port of Virginia in January 2018. Port of Virginia now participating in the USDA’s Southeast In-Transit Cold Treatment Pilot program. 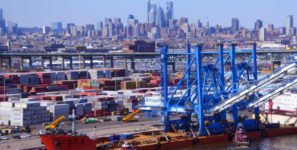 The Port of Virginia moved 237,816 twenty-foot equivalent units (TEUs) in September, which is growth of nearly eight percent, and container volume up nearly nine percent when compared with the same month last year. “Our gate volume was up nearly 15 percent, barge volume to Richmond Marine Terminal was up more than 12 percent and automobiles moving across Newport News Marine Terminal increased more than 28 percent, on a year-over-year basis,” said John F. Reinhart, CEO and executive director of the Virginia Port Authority (VPA). “We are processing this volume safely, with continued efficiency, consistent service and mitigating adverse impacts on the operation during construction. With three months remaining in the year, the port is tracking for a positive finish to 2017. On a calendar year basis, total TEU volumes are up 7.5 percent; containers up 8 percent; rail, up 4 percent; trucks, up 9.4 percent; and barge, up 26.5 percent. “We are seeing continued growth in all of our trade lanes, good peak-season volume and anticipate a solid performance for the remainder of the year,” Reinhart said. “We are now participating in the USDA’s Southeast In-Transit Cold Treatment Pilot program, which clears a direct route to Virginia for fresh fruit and perishables from South America. This program will create an opportunity for further diversification of our cargo mix.